Well, let me start by saying I am **Not** a furniture builder. I'm a total garage/power tool hack. 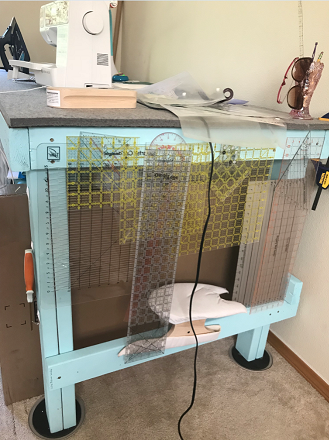 My ironing board wasn't doing the job for pressing, though my felt mat was amazing, it wasn't large enough for pressing panels/rows or larger items. 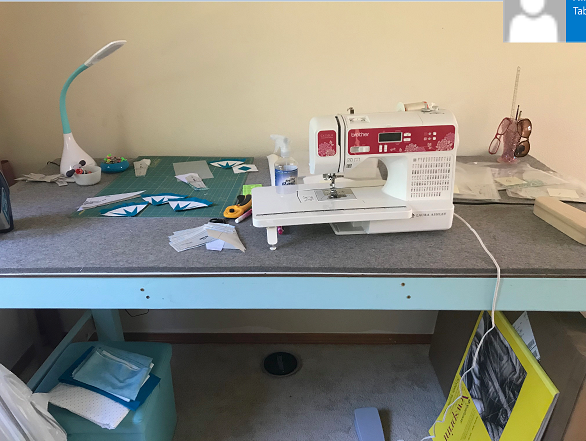 Not wanting to build a topper for the ironing board, I found a website where this woman built her own table. Sooo, I decided to build My own table. I needed it to be inexpensive, didn't want to hack an IKEA table, table needed to be tall for comfort while standing to cut/press (I'm 6' tall), and needed to be able to move it myself and/or dismantle when necessary. I'm 55 and single, so it's all me 'round here. I opted to use 2x4s, knowing it wouldn't be 'fancy' - but who cares, it's in my upstairs office/sewing room so no one would see it unless invited. I sketched out a frame for a 36x72" top (3'x6'). This image isn't to scale, but it shows how I framed the top. Needed good support for pressure when pressing. 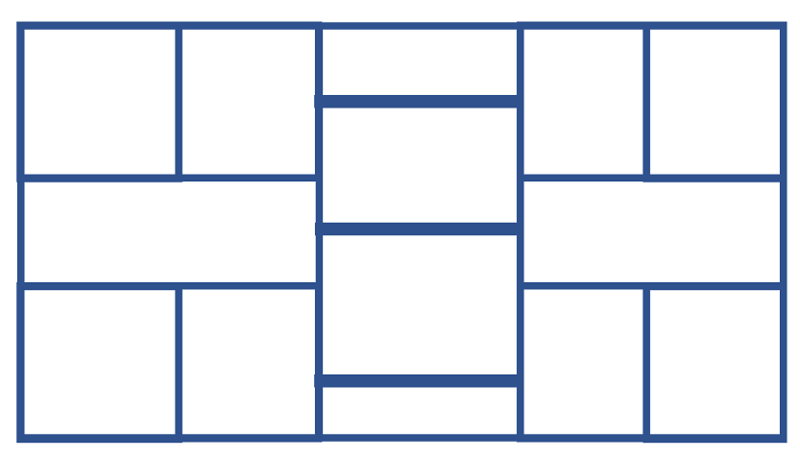 I used 72" long 2x4s for the front/back, and 33" for each side (Remember, a 2x4 is actually 1.5x3.5") to create a 3x6' rectangle. I then created pieces for the middle support. I didn't nail anything - it's all 2.5" brass wood screws. Next, I had 2x4s cut to 36" lengths (8 of them), screwed them together to form legs. Why didn't I go with a 4x4 post cut to 36" lengths? Too pricey, it was much cheaper to use the 2x4s - remember, it's all about the budget. Two sheets of masonite were used for the top. Sheet 1 - I nailed to the table top frame using roofing nails because they have wide, flat heads, and won't work through the masonite like other nails will. Then I brushed a shop glue (can't remember what brand) on the top and laid the 2nd piece on top, clamped it down, and put every heavy thing I could find on the table to be sure there was a ton of pressure applied Everywhere. Finally, a nice big table with a smooth top! But wait - I need to press, and I really want a pressing mat (Large) - but to buy them in a quilt shop is insane! Then, I found sutherlandfelt.com the felt isn't expensive, but it isn't inexpensive either. I purchased a 36"x72" piece of 3/4" thick felt to cover the top of the table. Wowza... This is amazing!!!! I used nails on the sides to hang my rulers, then I swapped them for 3M stick on hooks. The felt topper was 127 and change, but I had to pay extra for the cut and shipping - so it was around 175.00 (considering an 18x18 mat was almost 50.00). I pre-drilled all the holes, painted the pieces in the garage, hauled it upstairs, put down a drop cloth, and assembled everything in my office. For about 50.00 less than the cost of a small IKEA table (+ 30.00 for the ferry to Seattle + gas) I have a massive work table. The felt was already budgeted, but I'd planned to cut it and offer it for sale (thinking I would just use 1/2 the 36x72 piece) - but I opted to keep the whole piece for covering the entire table. The cost for a similar sized IKEA table (travel/ferry/gas) would have been >200.00 - and it wouldn't have been tall enough for me - or big enough. Wow!!! You did a great job on the table. Clearly you are a motivated quilter! I looked at the website for your felt topper. Can you tell us the F factor that you ordered? 36 x 72, 3/4 inch thick is great thickness for pressing, but I don't know how you determine the F factor in your purchase. Thanks! You did a great job and it looks like a handy worktable. It sounds like you put a lot of thought into the construction and design. Wow, what an outstanding table. You go girl!!! That is a terrific table. You did an excellent job in planning and constructing it. Love the wool topper. You did an outstanding job on that! Be proud of yourself. Also - if you and friends get together, I believe there's a discount when ordering larger quantities. You can cut the felt yourself with a box cutter (fresh blade!!!) or they will cut it for you for an add'l fee. If you email Sutherland, they'll give you a quote - but they don't include the shipping in the quote. If you need a custom cut, you'll need to call and order via phone. Love your work space and so timely for me. I just got my felt pressing mat, big enough for my ironing board, and was wondering if I should make a cover for it or if that defeated the whole purpose. Other than removing the cat hair and loose threads issue, I think I'll leave it as is. I use a lint roller for mine - it's exceptional when removing all manner of string or itty bits/dog ears from HSTs - and cat hair. LOL I only buy the rollers that are cream colored - they're obviously masking tape. The white ones don't have a really good "stick" to them. very namby pamby, whereas those that look like they're made from masking tape will pick up everything! Oh many, many years ago my husband had rescued two solid wood doors from the office trash. We took them to Colorado and he put one in the garage for a work table and the other one, nine foot, for my cutting table in the basement. I moved two years ago back to Texas. wish i could have taken the table/door with me. too heavy and I didn't know how much space I would end up with. I like it. I'd love to have one like it beside my sewing table. I love your ironing station. I am in the process of putting a large ironing station on top of a dresser. Ironing board fabric wears out too quickly for me. The ironing board is also in my way. I have an 18x18 felt pressing mat that I love. I haven't covered the board that I cut to top the dresser with because I just wasn't sure I like the ironing board fabric. This will be perfect. I will be ordering the felt later today. Thanks for the info. I had never thought of felt for my large board. That's a great work area/station. Nice to have everything handy. Wow, you did a great job; you go girl. Great work space and love the rulers on the end. Well Done.. I love it when the ladies "do their own building". Which felt product did you get 36"x 72" Please? That's awesome! thanks for sharing. Enjoy it!